After Jesus said all these things, he left Galilee. Jesus went into the area of Judea on the other side of the Jordan River. Many people followed Jesus. 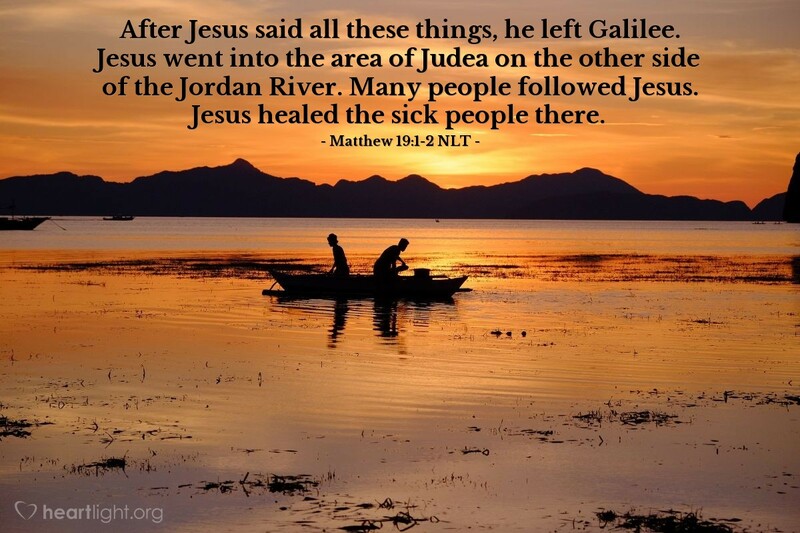 Jesus healed the sick people there. In transitional verses, we often find key elements of truth that Matthew most wants us to see. Jesus has brought to a close his Galilean ministry. He is headed for Jerusalem. The crowds are still infatuated with him. He will consistently heal them and minister to their needs even as he is headed toward the cross. His ministry as Immanuel, God with us, does not end simply because he is moving into the last stage of his earthly ministry. For all of us, transitions can be difficult. The key is to remain true to our calling from God just as Jesus did. Even when stress and pressures skyrocket, we need to remain who we are and not compromise the character that God has brought to life in us. Changeless and Infinite God, please help lead me through my transitions so that I can use each crisis as an opportunity to become more like Jesus. In his precious and mighty name I pray. Amen.